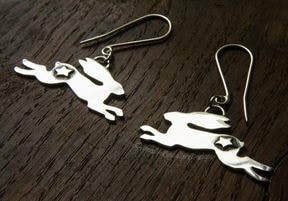 Individually hand cut from thick sterling silver, each of these cute hare earrings has a hand cut star detail on his side. Whilst these are constructed from thick silver, they are still lovely and light - perfect to wear all day long. Each earring is entirely handmade with each and every link soldered together to prevent any part of the earring coming apart. The silver has been oxidised and highlighted, and then waxed with a special microcrystalline wax to help protect the oxidised surface. Oxidisation is a surface treatment that can continue to lighten with wear. As your earrings will be made to order, please allow up to 10 working days for completion of your order.